Toyota’s FPEG features a hollow step-shaped piston, combustion chamber and gas spring chamber. 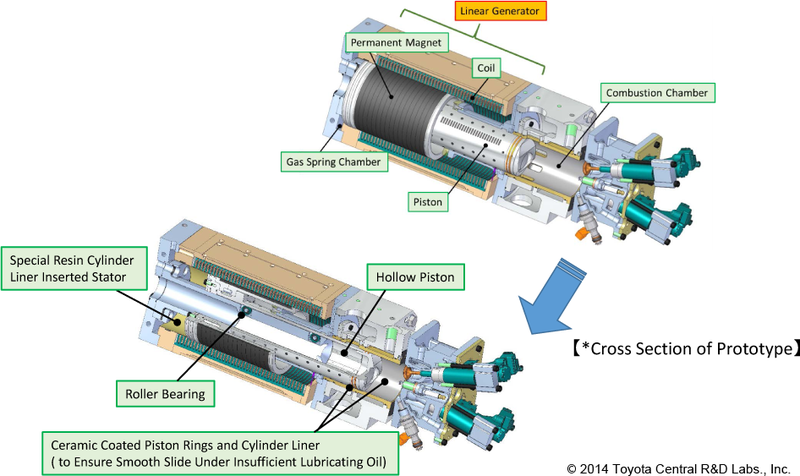 Click to enlarge.A team at Toyota Central R&D Labs Inc. is developing a prototype 10 kW Free Piston Engine Linear Generator (FPEG) featuring a thin and compact build, high efficiency and high fuel flexibility. Toyota envisions that a pair of such units (20 kW) would enable B/C-segment electric drive vehicles to cruise at 120 km/h (75 mph). The team presented two papers on the state of their work at the recent SAE 2014 World Congress in Detroit. Toyota’s FPEG features a hollow step-shaped piston, combustion chamber and gas spring chamber. The FPEG consists of a two-stroke combustion chamber, a linear generator and a gas spring chamber. The piston is moved by the combustion gas, while magnets attached to the piston move within a linear coil, thereby converting kinetic energy to electrical energy. The main structural feature of the Toyota FPEG is a hollow circular step-shaped piston, which Toyota calls “W-shape”. The smaller-diameter side of the piston constitutes a combustion chamber, and the larger-diameter side constitutes a gas spring chamber. FPEGs are attractive for a number of reasons, the Toyota researchers note, including thermal efficiency, low friction, and low vibration. Two basic design approaches have emerged: the first is a structure with two opposed combustion chambers; the second, a structure with one combustion chamber and one gas spring chamber. In the latter approach, the gas spring chamber is responsible for returning the piston for the subsequent combustion event. This second configuration is the one selected by Toyota for further investigation by both numerical simulation and experimentation. The Toyota FPEG is based on a double piston system; at one end is the combustion chamber, and at the other, the adjustable gas spring chamber. Burned gas is scavenged out through exhaust valves mounted in the cylinder head of the combustion chamber; fresh air is brought in through the scavenging port at the side wall of the cylinder liner. A portion of the kinetic energy of the piston is stored in the gas spring, and extracted on the return stroke to the combustion chamber side. A magnetic “mover” is mounted at the outer periphery of the piston; the mover and the stator coils together comprise the linear generator component of the FPEG. The larger cross-sectional area of the gas spring chamber leads to lower compression temperature of the gas spring chamber and consequently decreased heat loss. The inner periphery of the hollow piston also serves as a sliding surface on the column stay, enabling a steady small clearance between the magnets and coil for improved generating efficiency. The magnet is set far from the piston top, preventing magnet degaussing by heating. The researchers developed a one-dimensional cycle simulation to investigate the performance of the proposed structure, and used it to assess spark ignition combustion (SI) and premixed charged compression ignition combustion (PCCI). They achieved output power of 10 kW with both SI and PCCI combustion cases; the PCCI combustion case realized 42% thermal efficiency. They then constructed an FPEG prototype with a uni-flow scavenging type, two-stroke SI combustion system as an experimental study. They used ceramic-coated piston rings and cylinder liner they developed in order to ensure the smooth sliding of the piston even under insufficient lubrication. Poppet valves seated in a water-cooled cylinder head were actuated by hydraulic valve trains to control exhaust valve timing. Direct injection reduced unburned hydrocarbon emissions exhausted through the scavenging process. 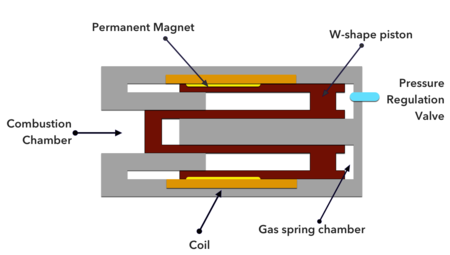 A pressure regulating valve in the gas spring chamber enabled a variable gas mass, thereby varying the stiffness of the gas springs—one of the variables to shift the FPEG to different operating points. The linear generator was a permanently excited synchronous machine consisting of the stationary coil, the mover (based on neodymium-iron-boron magnets) attached to the piston, and iron-cored stator. The poer electronics drive the machine as both a motor and a generator. The researchers designed the prototype control system to ensure that the compression ratio was kept to the values which enable stable combustions—i.e., the generating load coefficient is variable, not constant. The coefficient is determined by a feedback control method based on the postion and velocity of the piston. Assuming a multi-unit vehicle application, the multiple FPEGs would cancel out vibration through a horizontally opposed layout; the frequency and phase of the piston oscillation should be controllable. 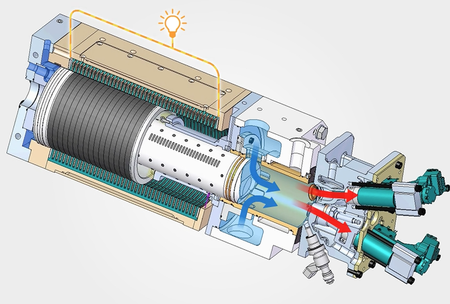 TDC and BDC need to be precisely controlled for stabilizing two-stroke combustion. After knocking or misfire, the oscillation must continue robustly. The prototype FPEG with W-shape piston and two-stroke SI combustion system achieved stable operation for more than 4 hours without any cooling and lubricating problems. The experimental analysis also showed that the precise control of ignition position is essential for stable operation of the FPEG. In future work, the research team plans to improve the power generation of the system and to perform a quantitative analysis of the efficiency.